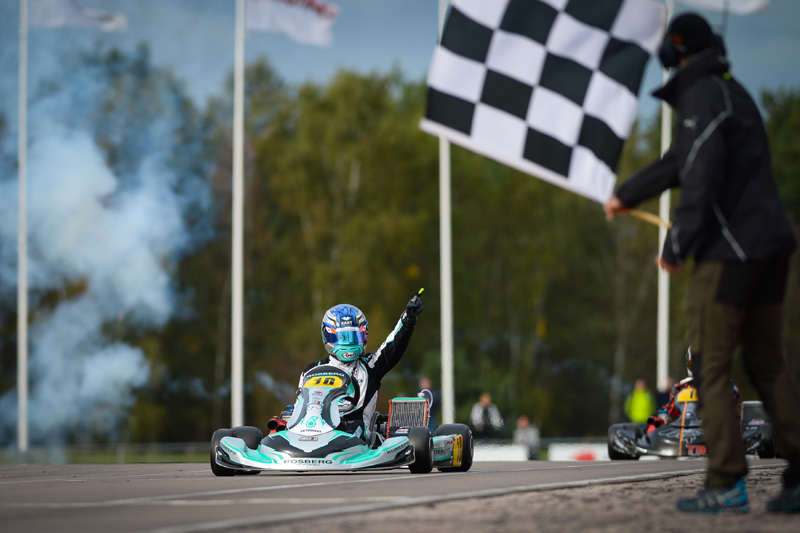 The OK 2018 Karting World Championship in Kristianstad was clearly one of the big goals of the season for the Rosberg Racing team. With the technical partnership and know-how of Petronas and Kart Republic, Lorenzo Travisanutto became the new FIA Karting World Champion after a weekend he totally dominated: pole position with the absolute best lap of the meeting, leader at the end of the qualifying heats and victory in the final after a crazy race, where the Italian took the best two laps of the finish! In Sweden, the Rosberg Young Drivers Academy has also enabled Taylor Barnard to be world-renowned. The Briton was one of the fastest drivers in the Junior World Championship field and finished in 4th place out of a total of 113 drivers. Only five months after its official launch in Italy, Rosberg Racing has reached the peak of World Karting. During three intense days of competition, the colours of the academy launched by the 2016 Formula 1 World Champion shined at the front of the pack to finish in triumph with the most coveted title of the season. "World champion! It's fantastic," admitted Lorenzo Travisanutto, immediately congratulated by Nico Rosberg, present in Sweden, and the whole team united around the team manager Dino Chiesa. "Since the European Championship, we have incredible technical potential, which we improved further in Kristianstad. I was able to achieve a perfect start to the meeting in Qualifying. In the Final, tyre management was one of the keys to success. Hannes Janker was very fast in the middle of the race, but I was able to regain the advantage shortly before the finish to cross the line as the winner." "It was an incredible moment, validating the direction taken in 2018," said Nico Rosberg. "Karting is where everything starts in motorsport. Winning the OK World Championship has a special meaning because the discipline is so difficult, with enormous pressure resting on the shoulders of these young drivers. They represent the elite of the discipline. As for Lorenzo, he did a fantastic job, he led his race as a great champion! " "I must also congratulate Taylor Barnard, who is still very young. For his first year in Junior, he showed his talent by leading the Qualifying Heats despite difficult weather conditions and finishing 4th in the Final, close to the podium. He will be closely followed in 2019." "This is a wonderful moment for Rosberg Racing and the Driver Academy that I launched at the start of the season. With Dino Chiesa, who was already my team manager in my final karting seasons before I went to single-seaters, we benefited from the best equipment: our partnership with Petronas, KR (Kart Republic) chassis and Parilla engines. The IAME factory have greatly contributed to this global success."